a book chick: "Carry On, Warrior"
my take: I was introduced to Momastery.com by my Pastor Heidi a few years back as part of an adult ed class at church. She gave us Glennon's autobiographical post of her addiction and I was hooked ... another resource for my ladies in recovery! Since that initial introduction, I've become a Momastery follower and enjoy reading Glennon's editorials and essays on parenting and doing hard things and helping others. The book is mainly a compilation of her essays/posts - which doesn't necessarily make for a great flowing book, but to me it's a warmer way to read her ideas. Many were new to me, some were repeats. The last chapter was the most meaningful to me. 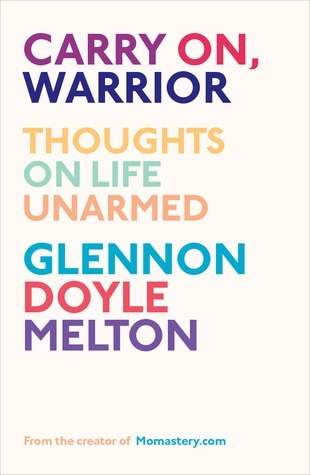 I love Glennon's vulnerability, her sense of humor, her un-dogged perseverance to be kind, and her encouragement of all who read her to carry on. my verdict: I love Glennon. Worth a read whether you're in recovery or not ... currently parenting or not. Check out a couple of her blog posts to see if she's your cup of tea.